Holzkirchen, October 4, 2018 - Sandoz, the Novartis generics and biosimilars division, today announces the launch of the second Sandoz Healthcare Access Challenge (HACk). The Sandoz HACk is a global competition that invites entrepreneurs and innovators in the field of digital technology to submit inspirational ideas with the potential to complement – or even positively disrupt – established approaches to driving access to healthcare. Sandoz HACk opens for entries today (October 4), closing on November 30, 2018. “There are still two billion people in this world not getting the medicines they need. 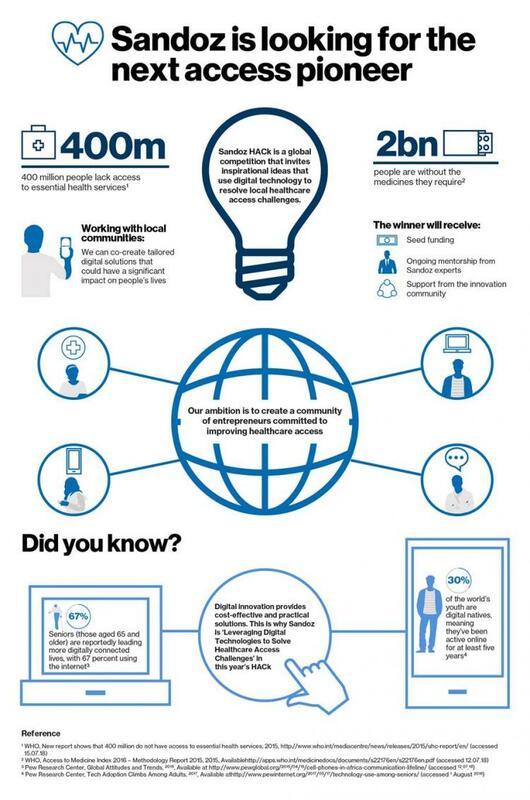 This is why we are launching Sandoz HACk as we aim to inspire and embrace the brave and innovative thinking of entrepreneurs and visionaries to improve access to healthcare around the world”, said Richard Francis, Division Head and CEO of Sandoz.